Background: This review was prompted by the relative paucity of published literature on the management and long term outcomes of BS. Methods: Retrospective review of medical records of 34 children from three tertiary UK paediatric nephrology centres. Results: Twenty (59%) children were born prematurely and 22 (65%) were of low birth weight. Twenty-three (68%) were non-Caucasian with 20 (59%) born to consanguineous parents. The commonest genetic mutation detected was CLCNKB (41%). Four (12%) children had profound deafness. Nephrocalcinosis was detected in 14 (41%) children. Of these, seven (50%) were diagnosed with BS within the neonatal period. Fluid and electrolyte requirements decreased with increasing age. Fluid and potassium requirements were greatest at 12 months of age (131 ± 49 mls/kg/ day and 6.3 ± 7.9 mmol/kg/day, respectively), and sodium requirements greatest at one month (7.7 ± 5.7 mmol/kg/day). Indometacin and captopril were used to reduce polyuria. Central venous access was required in six children (18%) to manage high fluid requirements in early infancy. A naso-gastric tube was required for administration of enteral fluids or medication in 22 (67%) children. Of these, nine (41%) later required surgical insertion of a gastrostomy. Nephrectomy was undertaken in one child. At 15 years of age, the mean (SD) estimated GFR was 57.1 (25.8) ml/min/per 1.73 m2. Nine (64%) children had developed CKD stage 3 or above. Estimated GFR was significantly lower in the children with nephrocalcinosis, (47.7 (19) ml/min/per 1.73 m2 vs. 74 (30) ml/min/per 1.73 m2, P = 0.03). Mean (SD) height and weight Z scores at 15 years of age were, -1.69 (2.09) and -1.22 (2.57), respectively. Conclusions: Our report highlights the significant challenges faced by health professionals caring for children with BS. We have shown the progression and prevalence of CKD, short stature and medication requirements through childhood. Bartter syndrome (BS) is a rare autosomal recessive condition characterised by abnormal sodium reabsorption in the loop of Henle. The condition presents mainly in childhood and is associated with clinical features such as hypokalaemia, hyponatraemia, metabolic alkalosis and decreased urinary concentrating ability [1-6]. There are five genetic mutations identified to date which classify BS in to five different types. Clinical presentation and severity varies with each type [4,5,7-9]. BS I, II and IV tend to present antenatally or in the neonatal period. BS III and V tend to have milder symptoms and present later in life. The correlation between genotype and the observed phenotype is variable and clinical manifestations and disease severity often differ [8,10,11]. Treatment focusses largely on fluid and electrolyte replacement and measures to reduce polyuria. Prostaglandin and angiotensin inhibitors are frequently used to manage polyuria and improve hypokalaemia [12,13]. Children may survive in to adulthood however there are limited comprehensive long-term outcome data in this population [8,10,11,14-20]. This study aims to describe the clinical features, molecular genetics, electrolyte and fluid requirements, as well as disease outcomes in children with BS up to 15 years of age. It is also aims to comprehensively report long-term outcomes, particular attention has been paid to the medical management through childhood, as well as outcomes at 15 years of age, including growth and chronic kidney disease (CKD) prevalence. Departmental electronic databases identified a total of 34 children managed in three large tertiary paediatric nephrology departments in the United Kingdom between 1987 and 2016. Retrospective data were collected for all 34 children using health records held at regional as well as the local hospitals. Data collected included demographic, genetic, clinical, biochemical as well as medication requirements during the first twelve months of life and up to 15 years of age. The glomerular filtration rate was estimated from height and plasma creatinine using the Schwartz formula (16). Data distribution was assessed using the Shapiro- Wilk normality test. The variance of the data was determined and comparison made between two groups of children using the t test for continuous data with equal variance. Data are presented as mean and standard deviation (SD), median and interquartile range (IQR) or percentages for categorical data. Z scores were calculated for height and weight from 1 year to 15 years of age. A P value < 0.05 was considered statistically significant. Statistical analyses were performed using Microsoft Excel 2013 (v 15.0). This was a retrospective review of clinical outcomes; there were no research interventions in this review therefore formal ethics approval was not obtained. Demographic data is summarised in (Table 1A). There were 21 male and 13 female children identified. Mean (SD) follow-up was 9.9 (5.1) years. Birth gestation ranged from 27-40 weeks (median 34 weeks, IQR 32-39 weeks). Twenty children (59%) were born prematurely (less than 37 weeks gestation), with six (18%) born at less than 32 weeks gestation. Birth weight ranged from 0.86 Kg – 3.77 Kg, mean (SD) was 2.25 (0.84) Kg. Twenty-two (65%) children were of low birth weight (<2.5 Kg), of which three were also classified as small for gestational age. Twenty-five (75%) pregnancies were documented to have been complicated by polyhydramnios, of which 19 (56%) resulted in premature delivery. The majority of children (68%) were non-Caucasian (18 Asian, 3 Middle Eastern and 2 Black). Twenty (59%) children were consanguineous, including all 18 Asian children. The diagnosis of BS was made in the neonatal period in 17 (50%) children. Five children were diagnosed between 2-12 months of life, nine children between 1-5 years of age and three between 5-10 years of age. Length of admission at diagnosis ranged from 0-842 days (median 28 days, IQR 4.75-63 days). Table 1A: Demographic data of 34 BS children analysed in cohort. Genetic confirmation was obtained in 18 children (Table 1B). Two families declined testing; three were found to have negative mutation analysis but had a biochemical and clinical phenotype entirely consistent with BS. Medical records only stated negative analysis and not whether all genotypes had been teste for. For 11 children the genetic data were unavailable; no reasons for this were given in the medical records. The commonest mutation detected was CLCNKB associated with BS III. Two children had two mutations detected, associated with two different types of BS (III and IV; II and V). Both of these children were born to consanguineous parents. Table 1B: Mutations identified in affected children with BS Data are presented as n (%). Profound sensorineural hearing loss was detected in four children (12%). In three cases this was diagnosed shortly after birth by newborn screening and the fourth case detected at nine months of age. Deafness developing later in childhood was not recorded; however routine regular hearing assessments were not performed beyond the neonatal period unless there was clinical concern, in line with the national UK Newborn Screening Programme. Two of these four children had genetic mutations detected: BSND mutation in one child and BSND and heterozygous CLCKNB mutation in the other. Deafness was not detected in any child with a CLCKNB or SLC12A1 mutation. All 34 children had regular renal ultrasound scans performed throughout childhood. Nephrocalcinosis was detected in a total of 14 (41%) children, seven being diagnosed with BS in the neonatal period. Nephrocalcinosis had developed in all affected children by the time they were five years old. Genetic mutations were detected in seven of these 14 children, two children had a negative mutation screen and in five children genetic results were not available. The most frequently detected mutation was KCNJ1 (three children) followed by SLC12A1 (one child), combined BSND/ CLCNKB (one child) and combined KCNJ1/CaSR (one child) mutation. Nephrocalcinosis was not associated with CLCNKB mutation. Precise urine output was not routinely documented in follow-up reviews and therefore the degree of polyuria or hypercalciuria was not available for reporting or analysis. Fluid requirements decreased with increasing age, the greatest requirements being noted during the first six months of life (Table 2). At 12 months of age the mean (SD) fluid requirement was 131 (49) mls/kg/day. Central venous access was required in six children (18%) to manage high fluid requirements in early infancy. The mean (SD) age of insertion was 5 (4.8) months. Central venous catheters were removed between 2 weeks to 28 months of age following insertion. Those children who required central venous access were all diagnosed before one month of age, had a low birth weight (<2.5 Kg), lengthy initial hospital admission (>28 days) and had fluid requirements greater than 200 mls/kg/ day. Insertion of a naso-gastric tube for administration of enteral fluids or medication was required in 22 (67%) children. Of these children, nine (41%) required the subsequent surgical insertion of a gastrostomy. One child with urine output greater than 200 mls/ kg/day during the second year of life, after maximising tolerated medication doses, underwent a unilateral nephrectomy to control the polyuria. This child later required dialysis and died due to complications related to septicaemia. Table 2: Fluid, electrolyte supplementation and medication requirements of BS children according to age. Data are presented as mean ± standard deviation. Electrolyte supplementation varied with age (Table 2). The greatest requirements were during the first year of life, with sodium requirements peaking at one month of age, mean (SD) 7.7 (5.7) mmol/kg/day and potassium at 12 months of age, mean (SD) 6.3 (7.9) mmol/kg/day. At 15 years of age, medication data were available for 14 children. Ten (71%) did not require sodium supplementation, six (43%) did not require potassium supplementation and three (21%) were managing without any electrolyte supplementation. Indometacin and captopril were the most commonly used medications to manage polyuria (Table 2). Adverse side effects previously reported in the literature associated with these medications, including hyperkalaemia and gastric perforation, were not reported (16). Ibuprofen was used in only one child between three and six months of age at a dose of 28 and 18 mg/kg/day, respectively. This was given in addition to captopril and stopped by the time the child was 12 months due to lack of desired response. Global developmental delay was diagnosed in six children. Of these six children, two had a BSND mutation and two a KCNJ1 mutation. These children all had prolonged admissions after birth (>28 days) and five were of low birth weight. All had fluid and electrolyte requirements at six months of age that were greater than the mean for that age group (fluids >200 mls/kg/ day, sodium >5 mmol/kg/day and potassium >3 mmol/kg/day). Central venous access was required in three (50%) and naso-gastric tube placement in four (60%) children. Height and weight measurements were assessed throughout childhood (Table 3). Z scores at 15 years of age for height ranged from -4.67 to 1.15, mean (SD) -1.69 (2.09) and for weight ranged from -6.73 to 3.62, mean (SD) -1.22 (2.57). At five years of age, ten (42%) and five (21%) children were below Z score -2.0 for height and weight, respectively. At 10 years of age, six (35%) and four (24%) children were below Z score -2.0 for height and weight, respectively. At 15 years of age, six (43%) and four (29%) children were below Z score -2.0 for height and weight, respectively. Table 3: Height and weight Z scores of BS children according to age. Data are presented as mean ± standard deviation. There were 14 children who had reached 15 years of age, the mean (SD) estimated GFR was 57.1 (25.8) ml/min/1.73 m2. CKD stages by age are shown in (Figure 1A) and the decline of estimated GFR over time is shown in (Figure 1B). More than half (nine children, 64%) had developed CKD stage 3 or above by 15 years of age. Nephrocalcinosis was seen in nine (64%) children with CKD stage 1 to 5 and seven children of this sub-group had CKD stage 3 or above. The mean (SD) estimated GFR was lower in the group of children who had developed nephrocalcinosis, compared with the group who had not (47.7 (19) ml/min/per 1.73 m2 versus 74 (30) ml/min/per 1.73 m2, P = 0.03). Seven (50%) children were prescribed indomethacin, the mean (SD) estimated GFR was 56.6 (25.9) ml/min/per 1.73 m2 in this group. Captopril was prescribed in two children, their estimated GFR was 40.6 and 48.3 ml/min/ per 1.73 m2, respectively. Only one child at 15 years of age was prescribed captopril and indomethacin, their estimated GFR was 40.6 ml/min/per 1.73 m2. The commonest mutations detected in children at 15 years of age with CKD stage 1 to 5 were KCNJ1 (four children, including one with a compound KCNJ1/CaSR mutation) followed by CLCNKB (two children). Genetic analysis was not available for seven children and one family declined testing. Figure 1A: Chronic Kidney Disease stages in BS children aged between1 and 15 years. Number of BS children with CKD at 1, 5, 10 and 15 years of age. Sample size varies with each age group, at 1 year N=17, 5 years N=22, at 10 years N=16 and at 15 years N=14. CKD stage 1: ≥90 ml/min/per 1.73 m2, CKD stage 2: ≥60 ml/min/ per 1.73 m2, CKD stage 3:≥ 30 ml/min/per 1.73m2, CKD stage 4: ≥15 ml/min/per 1.73 m2, CKD stage 5: <15 ml/ min/per 1.73 m2. 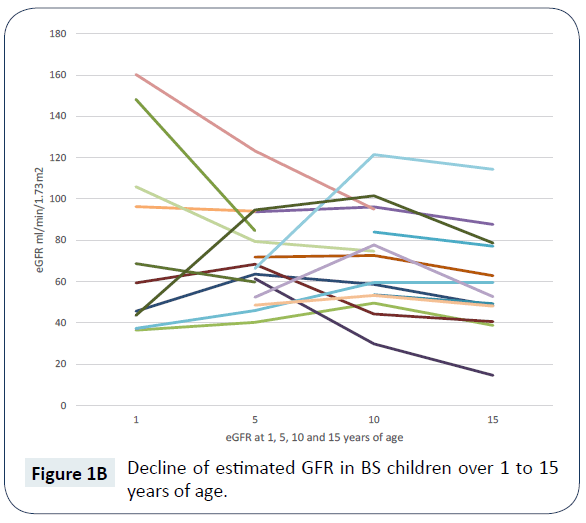 Figure 1B: Decline of estimated GFR in BS children over 1 to 15 years of age. Three children died, aged 13 months, 19 months and six years of age, respectively. Two children had an identified mutation of CLCNKB and the third had a combined mutation of BSND (homozygous) and CLCKNKB (heterozygous). Two children died following a gastrointestinal illness, with profound hypokalaemia resulting in cardiac arrest with unsuccessful resuscitation. Indometacin had been prescribed in one child and the other was on a combination of indometacin and captopril. The third child was not prescribed medication to reduce polyuria at the time of his death, but had above mean requirements for sodium and potassium supplementation. His fluid requirements were above mean in the first year of life and at the age of two years had a unilateral nephrectomy performed. At the age of five years he had an estimated GFR of 21 ml/min/per 1.73 m2. Within twelve months of nephrectomy peritoneal dialysis was commenced. He presented to his local hospital with symptoms of gastrointestinal illness which led to septicaemia and he died as a result of infection related complications. This manuscript reports the phenotype, clinical presentation, fluid, electrolyte management, medication dosage, growth and chronic kidney disease stages of 34 children with BS. We have presented data on, the length of admission after diagnosis, fluid and electrolyte requirements and drug use from birth to 15 years of age. We have also highlighted the progression and prevalence of CKD, short stature and poor weight gain in this population. Our report highlights the significant challenges these children pose to the paediatric nephrologist. Previous series have reported that affected children are often born prematurely or small for gestational age . Our report has confirmed this observation, however a greater proportion of babies were of low birth weight, rather than small for gestational age. Prematurity and rates of polyhydramnios were similar to previous reports . Consanguineous birth rates were high in our cohort. This was reflected in the relatively high incidence of compound mutations. Those children born prematurely and of low birth weight required lengthy admissions, firstly in the neonatal intensive care unit and then the paediatric ward before discharge home. Genetic confirmation of BS was possible in 18 children. BS III (CLCNKB mutation) was most prevalent, followed by BS II (KCNJ1 mutation) in our cohort. Prevalence of BS types varies in the literature, in the German study BS II followed by BS III was the most common  and the French study revealed BS I to be the most common . A Korean review found similar prevalence of BS types to our study . Our cohort identified two patients with mixed mutations which have not previously been reported. Deafness was only detected in patients with BSND mutation, similar to the observations of previously published reports . We did not identify late onset deafness, through routine hearing screening was not performed in older children unless there were clinical concerns, and therefore we cannot confirm whether sub-clinical hearing loss developed later. Nephrocalcinosis has previously been reported in association with BS I and II . The commonest mutation associated with nephrocalcinosis in our cohort was KCNJ1. Nephrocalcinosis was seen in a patient with a compound BSND/CLCNKB mutation, which has not previously been reported. This child was diagnosed in the neonatal period and had a protracted hospital admission after birth (28 months), with fluid requirements greater than 200 mls/kg/day in the first 12 months of life. He was the only child to require a unilateral nephrectomy to assist in his fluid and electrolyte management. We believe this is the first comprehensive documentation of the fluid and medication requirements of children with BS throughout childhood. Particular attention should be given to babies born at low birth weight, those who require prolonged hospital admissions and those who have high fluid requirements (>200 mls/kg/day). In our cohort, all of these children required enteral and venous access to deliver the required fluid, electrolytes and medications to maintain fluid and electrolyte homeostasis. Electrolyte requirements peaked in the first 12 months of life and medication doses by the age of five years. As children grew older, dietary manipulation was a popular strategy to reduce the reliance on supplementation. The use of sodium and potassium supplementation increased in the first year of life followed by a decline between 5, 10 and 15 years of age. Supplementation and medication data was available for 17 children at 5 years of age. Five children in this group were not prescribed any medication (eGFR range 21.8-72.4 ml/min/1.73 m2), three were prescribed indomethacin and captopril (eGFR range 59.8-63.6 ml/min/1.73 m2). The cohort is too small to conclude that it was a reduction in the eGFR potentially caused by side effects of medication, used to control polyuria that then resulted in lower supplementation requirements later in life. Detailed dietary data were not collected nor was the use of amiloride, which can also be used to reduce the daily potassium requirements . The current literature contains reports of individual cases of BS developing CKD requiring renal transplantation . There is a lack of data reporting the prevalence of CKD in larger cohorts. We found that all stages of CKD were present in our cohort, suggesting that renal dysfunction is more prevalent than previously reported [11,17]. The most prevalent mutations identified in the CKD population were KCNJ1 and CLCNKB. At one year of age all children had CKD stage 1 to 3. By five years of age, 21 (96%) children had CKD stage 1 to 3. At ten years of age, 8 (50%) children had CKD stage 1 to 3. At the age of 15 years, nine (64%) children had progressed to CKD stage 3 to 5. The estimated GFR was shown to be significantly lower in the group of patients who had developed nephrocalcinosis. The presence of nephrocalcinosis and lower eGFR is an observation and not intended to be interpreted as a direct cause of the lower eGFR. The majority of children with nephrocalcinosis were born at low birth weights, diagnosed in the neonatal period, had fluid requirements >150 ml/kg/day in the first year of life and were prescribed indomethacin by 1 year of life. The relationship between nephrocalcinosis and eGFR is complex and likely to involve a number of causative factors. Renal biopsies were not performed in children with progressive CKD. The cause of renal dysfunction in BS remains unclear [21-25]. Our cohort demonstrated lower Z scores for height and weight than previously reported . At 15 years of age, 43% and 29% of patients had Z scores ≤ -2 for height and weight, respectively. Growth hormone was not used in any of these children despite the presence of advancing CKD. In view of these findings, particular attention should be given to the optimisation of nutrition throughout childhood to maximise growth potential. The use of growth hormone replacement therapy in BS and its effects on height have not been reported, but could be considered in the setting of on-going poor growth despite adequate nutritional intake. The deaths in our cohort highlight the importance of urgent medical review during times of acute illness, particularly gastrointestinal infections, where there may be excessive additional fluid and electrolyte losses. During the acute phase of such types of illnesses, medications to reduce polyuria (for example prostaglandin or angiotensin inhibitors) should be discontinued and electrolyte and fluid status monitored closely. Parents should be educated and feel empowered to seek urgent medical advice when necessary. Only one child had a unilateral nephrectomy to help reduce fluid requirements and polyuria, he later required peritoneal dialysis and died secondary to complications of sepsis. It is beyond the scope of the study to advice on the suitability of this intervention to reduce polyuria and could lead to early renal replacement therapy or fatal outcome. The limitations of our study include the retrospective nature of the data collection, and the incomplete nature of some of the data according to age. Some children were diagnosed beyond the neonatal period therefore birth details were not available, also children include the study were born between 1987-2016 therefore had not reached the age of 15 years at the time of data collection and analysis. Four children were lost to follow up; reasons given were emigration abroad or transfer to another centre. Genetic results were not available for 11 children. A diagnosis of BS had been made from clinical and biochemical features but no indications were provided as to why the result was not available. The authors believe this may reflect the cost and limited availability of the screening tests during the study period. This finding highlights the importance of recruiting children with rare conditions to national databases where prospective data can be collected. This retrospective review informs the understanding of the initial presenting features, the medical management and disease progression in children with BS. Our key findings relate to growth and CKD outcomes. Growth is impaired throughout the childhood, resulting in over one third of children having a height below the second centile at 15 years of age. Nearly two thirds of children at 15 years of age had progressed to CKD stage 3 to 5. BS is a long-term condition which not only affects fluid and electrolyte homeostasis but can lead to the progression of CKD. The authors would like to thank participating staff, at Royal Manchester Children’s Hospital, Evelina London Children’s Hospital and Birmingham Children’s Hospital, including their respective district hospitals, without whom the data collection would have been impossible. Bartter FC, Pronove P, Gill R, MacCardle RC (1962) Hyperplasia of the juxtaglomerular complex with hyperaldosteronism and hypokalemic alkalosis. Am J Med 33: 811-828. Kurtz I (1998) Molecular pathogenesis of Bartter’s and Gitleman’s syndromes. Kidney Int 54: 1396-1410. Stein JH (1985) The pathogenetic spectrum of Bartter’s syndrome. Kidney Int 28: 85-93. Simon DB, Karet FE, Hamdam JM, Dipietro A, Sanjad SA, et al. (1996) Bartter’s syndrome, hypokalaemic alkalosis with hypercalciuria, is caused by mutations in the Na-K-2Cl cotransporter NKCC2. Nature Genet 13: 183-188. Simon DB, Karet FE, Rodriguez Soriano J, Hamdam JH, DiPietro A, et al. (1996) Genetic heterogeneity of Bartter’s syndrome revealed by mutations in the K+ channel ROMK. Nature Genet 14: 152-156. Gill JR, Bartter FC (1978) Evidence for a prostaglandin-independent defect in chloride reabsorption in the loop of Henle as a proximal cause of Bartter’s syndrome. Am J Med 65: 766-772. Uribarri J, Alveranga D, Oh MS, Kukar NM, Del Monte ML, et al. (1985) Bartter syndrome due to a defect in salt reabsorption in the distal convoluted tubule. Nephron 40: 52-56. Brochard K, Boyer O, Blanchard A, Loirat C, Niaudet P, et al. (2009) Phenotype-genotype correlation in antenatal and neonatal variants of Bartter syndrome. Nephrol Dial Transplant 24: 1455-1464. Birkenhäger R, Otto E, Schürmann MJ, Vollmer M, Ruf EM, et al. (2001) Mutation of BSND causes Bartter syndrome with sensorineural deafness and kidney failure. Nature Genet 29: 310-314. Pressler CA, Heinzinger J, Jeck N, Waldegger P, Pechmann U, et al. (2006) Late-onset manifestation of antenatal Bartter syndrome as a result of residual function of the mutated renal Na+-K+-2Cl- co-transporter. J Am Soc Nephrol 17: 2136-2142. Seys E, Andrini O, Keck M, Mansour-Hendili L, Courand PY, et al. (2017) Clinical and genetic spectrum of Bartter syndrome type 3. J Am Soc Nephrol 28: 2540-2552. Fichman MP, Telfer N, Zia P, Speckart P, Golub M, et al. (1976) Role of prostaglandins in the pathogenesis of Bartter's syndrome. Am J Med 60: 785-797. Hené RJ, Koomans HA, Dorhout Mees EJ, vd Stolpe A, Verhoef GE, et al. (1987) Correction of hypokalemia in Bartter's syndrome by enalapril. Am J KidneyDis9: 200-205. Puricelli E, Bettinelli A, Borsa N, Sironi F, Mattiello C, et al. (2010) Long term follow-up of patients with Bartter syndrome type I and II. Nephrol Dial Transplant 25: 2979-2981. Marco-Franco JE, Morey A, Ventura C, Gascó JM, Alarcón A, et al. (1994) Long-term evolution and growth patterns in a family with Bartter's syndrome. Clin Nephrol 42: 33-37. Schwartz GJ, Brion LP, Spitzer A (1987) The use of plasma creatinine and urea concentration for estimating glomerular filtration rate in infants, children and adolescents. Pediatr Clin North Am 34: 571-590. Vaisbich MH, Fujimura MD, Koch VH (2004) Bartter syndrome: benefits and side effects of long term treatment. Pediatr Nephrol 19: 858-863. Griffing GT, Aurecchia SA, Sindler BH, Melby JC (1982) The effect of amiloride on the renin-aldosterone system in primary hyperaldosteronism and Bartter's syndrome. J Clin Pharmacol 22: 505-512. Peters M, Jeck N, Reinalter S, Leonhardt A, Tönshoff B, et al. (2002) Clinical presentation of genetically defined patients with hypokalemic salt-losing tubulopathies. Am J Med 112: 183-190. Lee BH, Cho HY, Lee H, Han KH, Kang HG, et al. (2012) Genetic basis of Bartter syndrome in Korea. Nephrol Dial Transplant 27: 1516-1521. Proesmans W (1997) Bartter syndrome and its neonatal variant. Eur J Pediatr 156: 669-679. Kim JY, Kim GA, Song JH, Lee SW, Han JY, et al. 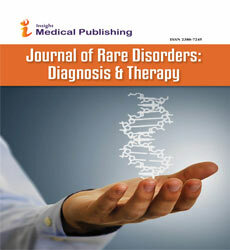 (2000) A case of living-related kidney transplantation in Bartter's syndrome. Yonsei MedJ 41: 662-665. Sardani Y, Qin K, Haas M, Aronson AJ, Rosenfield RL, et al. (2003) Bartter syndrome complicated by immune complex nephropathy: case report and literature review. Pediatr Nephrol 18: 913-918. Yamamoto T, Noble NA, Cohen AH, Nast CC, Hishida A, et al. (1996) Expression of transforming growth factor-beta isoforms in human glomerular diseases. Kidney Int 49: 461-469. Kömhoff M, Reinalter SC, Gröne HJ, Seyberth HW (2004) Induction of microsomal prostaglandin E2 synthase in the macula densa in children with hypokalemic salt-losing tubulopathies. Pediatr Res 55: 261-266.